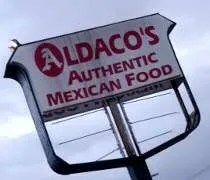 Aldaco's Authentic Mexican Restaurant on South Cedar Street in Lansing. Last night, I was really craving tacos. We were really close to making a Taco Bell run at midnight, but decided it was a bad idea. The craving never really went away. When J suggested going out for dinner, I suggested that Mexican place where Cedar meets Pennsylvania that has stared us in the face since we moved here almost a year ago. Aldaco’s is right on the corner of Cedar Street where it intersect with Pennsylvania Avenue. It sits between the White Castle the empty end of a strip mall that used to house a Hollywood Video. The building is small, but the parking lot is always full. There’s an entrance on both Pennsylvania and Cedar Street. We were coming from the Pennsylvania side, so we used that entrance then drove around the front to the parking lot. Inside we were met by a hostess. She grabbed a couple menus and asked if we were going to order the buffet or order from the menu. J said menu and I just went along with it. After passing the buffet, which is right near the entrance, I should have changed my mind but I didn’t. The buffet was filled with taco shells, tortillas, and fillings as well as tacquitos, burritos, rice, beans and even some desserts.